William Wegman (American, b. 1943) is an internationally-renowned and seminal American artist with a prolific career spanning more than five decades. He became a household name for his enigmatic photographs of his beloved Weimaraners, an ever-growing cast beginning with his first dog and 12-year collaborator, Man Ray, in Los Angeles in 1970. Wegman lived and worked in Los Angeles in the early 70s, and was a key figure in what came to be known as West Coast Conceptual art and a pioneer in the developing medium of video art. 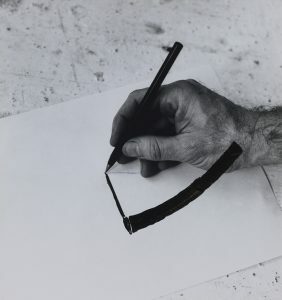 Importantly, this presentation highlights the artist’s personal sense of humor as well as the importance of mark-making and the evidence of the artist’s hand that is central to Wegman’s practice. The exhibition at Telfair Museums includes a selection of the artist’s early conceptual videos in black and white, focusing on the early works when Wegman began working with Man Ray in California. Also on view are drawings, paintings, altered photographs, and large format polaroids made from the 1970s to present day, reinforcing the connections between all of his artwork in order to highlight a central tenet of his artmaking: the ever-present artistic impulse to work and rework—thereby “improving”—imagery with Wegman’s uniquely playful lens while also humorously critiquing the medium itself. William Wegman was born December 2, 1943 in Holyoke, Massachusetts. He holds a BFA in painting from the Massachusetts College of Art in Boston (1965) and an MFA from the University of Illinois Champagne-Urbana (1967). Wegman’s photographs, videotapes, paintings, and drawings have been exhibited in museums and galleries internationally. His retrospective William Wegman: Photographs, Paintings, Drawings and Video toured throughout Europe including the Stedelijk Museum, Amsterdam; the Kunstmuseum, Lucerne; the Frankfurter Kunstverein; the Centre Georges Pompidou, Paris and the Whitney Museum of American Art in New York. Recent exhibitions have included touring retrospectives of Wegman’s work in Europe, Scandinavia, Japan, and Korea. In 2006-2008, Funney/Strange, a retrospective of Wegman’s paintings, drawings, videos, and photographs, toured the US, appearing at the Wexner Center, the Smithsonian and the Brooklyn Museum of Art. 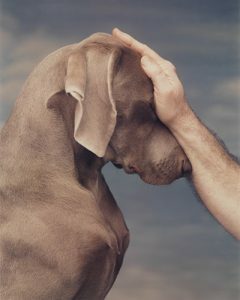 Wegman’s collaboration with his Weimaraners includes several decades of work with the 20 x 24 Polaroid camera; video and films for Saturday Night Live, Nickelodeon, and Sesame Street; a feature length film, The Hardly Boys in Hardly Gold; and commissions ranging from the Metropolitan Opera and Wallpaper Magazine to a cover for the New Yorker. Wegman has appeared on The Tonight Show with Johnny Carson and with Jay Leno, The Colbert Report and the David Letterman Show. Wegman is the author of numerous books for adults, over a dozen books for children and, most recently William Wegman: Paintings (spring 2016/Abrams). A new book surveying almost fifty years of Wegman’s work will be published by Thames and Hudson in 2017. Wegman lives and works in New York and Maine. This exhibition is organized by Telfair Museums and curated by Rachel Reese, Associate Curator of Modern and Contemporary Art, and courtesy Sperone Westwater Gallery, New York. Don’t miss this special evening with a major figure in American art, when William Wegman lectures on his work in photography, painting, and video through a career that has spanned five decades. Reception to follow. Lecture is sponsored by the Telfair Academy Guild. Say goodbye to the “dog days” of summer and kick off the start of the school year with a family day devoted to the art of William Wegman. Participate in gallery activities, make your own altered photos and postcards, and find out more about Savannah dogs available for adoption. Sponsored by the Georgia Power Foundation.